Easily one of the biggest tourist and business destinations in the country, Las Vegas has become quite legendary in all things fun, exciting, ‘bad,’ and otherwise appealing to people of all interests. The City that Never Sleeps is always filled with lights and people looking for something to do, including eating and embibement. Thus is Vegas known for its countless high class restaurants and bars; even if you’re not into gambling, one can always revel in the food aspect of the city between shows. One can certainly find success with opening up a food business here, so it’s no surprise that food trucks have been flourishing for years now as they take advantage of the sun-filled, tree and light-lined streets. As with any city, starting up a food truck here isn’t particularly easy, but getting past those initial difficulties and learning how to take advantage of local and flowing tourist populations, usually with something unique/trendy but with strong return-visit appeal, can lead to success. Many a truck has been going on for the 4-6 year period of popularity so far, getting together to take advantage of popular streets an events going on year-round in this winter-absent area. Sadly it seems the Las Vegas Food Truck Coalition only survived until 2013, a surprise considering how many trucks are out there and how busy of a city it is. Luckily there’s still plenty of trucks one can contact to look for advice and organization plans… that is, if they’ll actually respond (local owner attitudes are rather up in the air about this). 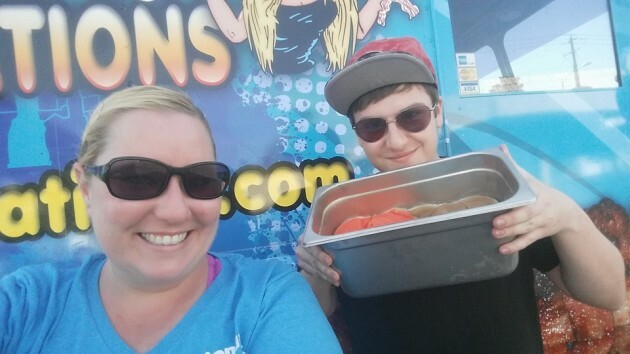 One person we KNOW is willing to help, though, is Kelly Atkinson of Blondie’s Bacon Creations. Having been in the Vegas streets for over a year now, with a further year of planning and development, Kelly has provided us with a great insight into the experience of starting a truck and operating in Sin City. We want to wish her an extra big thank you for all the information she’s provided; if new truck owners can’t put any of this to use then they aren’t reading close enough! Okay, before we actually get into it, I should warn readers that the first answer is QUITE a long one. I was planning on cutting it down, but after reading through it thoroughly I just could not take the step to get rid of any word Kelly wrote down here; it’s all things that I think deserves to be out there. So enjoy, expect an interesting story followed by some REALLY informative and reliable information on the Vegas truck scene. Question: Let’s begin with you. Tell us about the food truck and how you ended up starting it. Kelly: I have to start off by saying I am a single mom, I have raised a 16 year old son and a 10 year old daughter all on my own. Proud to say that both of them are polite, respectful and gracious young people! I have both of them work with me on the truck from time to time and really hope they are learning from the experience. So I am a “Jill of all trades” – literally! I worked as the Office Manager for the Union at Hoover Dam, I drove Semi-tractor trailers OTR as well as an end-dump locally; Accounting for a Helicopter Tour company; Customer Service in Travel and in Insurance. I grew up training horses and giving lessons to supplement my expensive horse habit. I have ALWAYS loved to cook. At every office job I have ever had – every one of my former coworkers will tell you the same thing “Kelly ALWAYS cooks for us”. At my last job in Customer Service – I had moved from Boulder City NV to Henderson NV and one of my coworkers around the same time announced her engagement to the love of her life. I immediately became excited because we could have a joint bachelorette party + housewarming! (I love to throw parties as well). All of the ladies in the office were super excited to have an adult entertainer come dance for us and whatnot — but the bride to be said “No no no strippers – I just want to get chocolate wasted, eat a bunch of bacon and hang with my girls”. So I thought to myself – I can do that! Chocolate wasted and eat a bunch of bacon… Challenge accepted! I bought 5lbs and made a bacon tower; lemon chicken salad lettuce wraps, pasta salad – a full spread of yummy dishes. Of course the bacon tower didn’t last long, but it was pretty awesome while it did! The following Monday I didn’t start work until 130 in the afternoon and when I came in – the general consensus was that I needed to not be working in the office anymore – that I really should look into doing opening a restaurant or open a food truck. They had me thinking! And so I embarked on an 18 month journey that would forever change my life!!! The first thing was coming up with a concept. When I drove truck – my CB handle was “Blonde Bombshell” – It seemed like EVERYTHING I was cooking at the time had bacon in it, on it, wrapped around it etc… Blondie’s Bacon Creations just seemed to make sense! I struggled with writing a business plan as a gourmet or specialty food truck is still quite new – especially in Las Vegas. I reached out to several food truck owners in the Las Vegas area however no one was willing to speak to me. I even offered to work for free just so I could get a feel for the kitchens and line they had in place – still no one… I was lucky to find a fellow Bacon food truck owner in San Francisco who was willing to give me an hour of his time and I asked away; every question I could possibly think of!!! (I’ll forever be grateful to him for pointing me in the right direction). Financing was a struggle to say the least – I went through about 6 months of trying to find financing. (What a waste of time – no one will finance a food truck – the banks who will want 15% interest on a 3 year note which is just not a realistic payment to come up with every month). I was lucky to have the support of my mom to ultimately help with the financial part. The timing was right that we were able to have the equity in our home pay for the truck and get the business started. I will say for sure – do your homework on any private parties/financial advisors/lenders who say for certain they will get you financing or lease options on a truck. I started doing my homework on buying a used truck vrs. Custom built. After looking at least a dozen trucks which were for sale in the area and seeing the condition of them; the lack of maintenance, lack of cleanliness – it just really made sense to have a custom kitchen built. The Company I ended up going with to do a custom build was recommended to me thru a finance company and a popular food truck website. I went thru nothing short of a nightmare with trying gain possession of my truck even though I had totally paid for it – the builder decided to withhold my property. I ended up having to hire an attorney to go after the builder to get my truck. It took about a month and finally – I was able to drive my truck home. Even though there has been some really crummy issues here and there – generator problems, tire getting slashed, flat tires, more generator problems… I just absolutely LOVE what I am doing. There isn’t a day that goes by that I have a single regret about opening Blondie’s Bacon Creations. I am setting an amazing example for my kids that they can do anything they put their minds to! I hope when my kids work with me on the truck they are seeing exactly what hard work is! And then they also get to see how rewarding it is too!!! 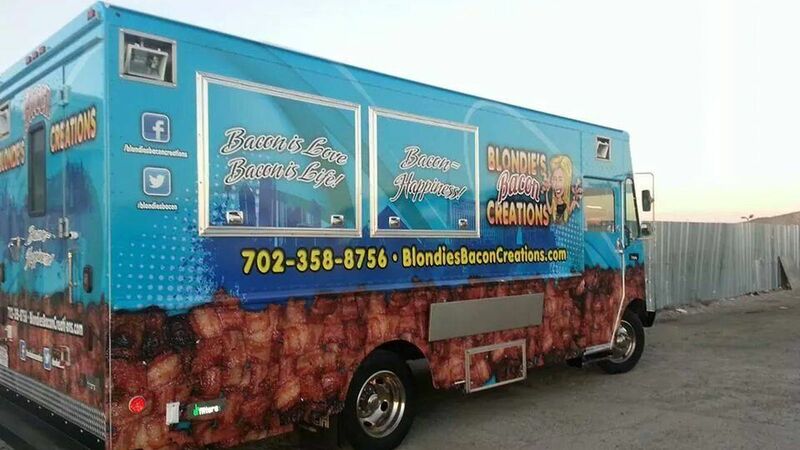 I am hoping in the future to send my son with “Son of Blondie’s Bacon Creations” food truck to college – and who knows – “Daughter of Blondie’s Bacon Creations” in the future! So this is my story – and my message is “Follow your dreams, YOU CAN DO IT” “Don’t give up, FIND A WAY” Oh and – “Bacon makes everything better”. Q: How well has the Las Vegas environment developed for food truck startup and survival? How long exactly has it been going on for? 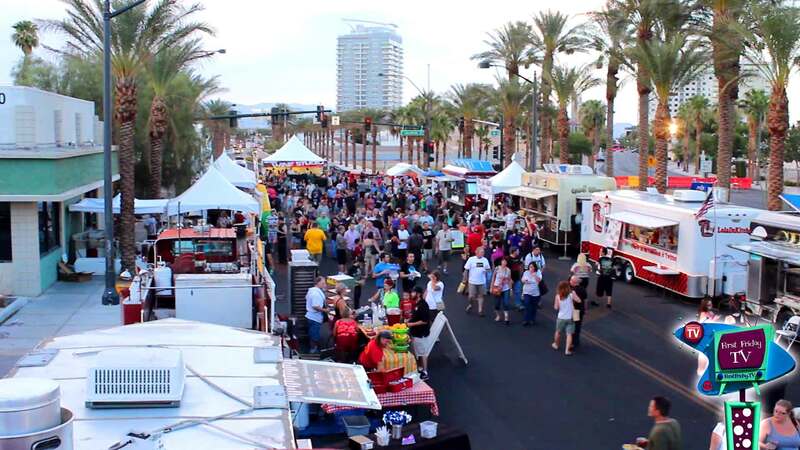 T he cities around Las Vegas – Henderson, Green Valley, Summerlin, North Las Vegas- have all embraced the weekly Farmers Markets and have extended the invite to have food trucks participate in the weekly markets as well. When the weather is nice (every month but June – September) there are several pavilions, sporting events, bicycle & hike events, marathons, car shows & parades which are all organized by the different Cities in and around LV – they love to have Food Trucks join as well. 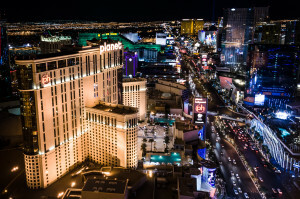 Las Vegas being known for 24/7 business – we actually have a lot of call centers and office buildings who are set up in areas that do not have easy access to food. Those businesses are wild about having food trucks come to serve employees! From an employee standpoint this makes it easy to grab their meal and enjoy the rest of their break. For employers – an employee who doesn’t leave the property likely isn’t going to be late getting back from their break and is going to be happier because they get to have a meal without driving and waiting in line or drive thru. Q: In your opinion, what are the main benefits and difficulties for food trucks in operating within Las Vegas, as compared to other cities? Kelly: Benefits — Our weather the majority of the year is AMAZING. And I’ll say the difficulties to operating a food truck in LV is ALSO the weather!!! The summer is just really stinking hot!!! The weather being so hot is hard on equipment and hard on those of us working in the heat too – Heat Exhaustion is scary and real! Q: Vegas is quite the crowded and busy city. How does this affect daily parking? Are there even relatively easy or consistent places to get parking, or do you have to mainly rely on events and scheduled gigs? Kelly: The parking situation all depends. There are trucks who participate in the Lottery in the Downtown Fremont Street area – they are looking for more of the tourist traffic. I personally do on events and scheduled gigs. I will start doing the office complexes again (typically 2 per day) for lunch service starting in October when the weather is cooler. Again, this Valley is so big – and there are only maybe 75-90 Gourmet/specialty food trucks or trailers operating. Q: That said, once you’ve found a spot, I would imagine the traffic is rather good. Is that true, or is there a lot of ‘competition’ that affects the number of customers that usually come up? 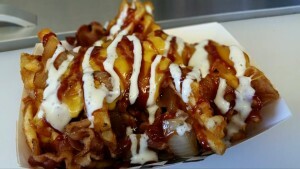 Q: What are the food truck regulations like in Nevada, and where can one go to find out more about them? Are there any that you think new trucks should be particularly aware of right now? (A) Except when operating at a special event, a MOBILE UNIT shall not operate from any single location for more than half an hour. ( B) A MOBILE UNIT may not operate later than 7:00 p.m. or half an hour after sunset, whichever occurs first, unless they are at a special event. (C) A MOBILE UNIT may not sell products on a street where the posted speed limit is above 25 mph. (D) A MOBILE UNIT may not operate within 250′ of another vendor. (E) A MOBILE UNIT may not operate within 1,000′ of a school less than one hour after the school’s dismissal time. (F) A MOBILE UNIT may not play music when parked. Q: If it hasn’t been brought up yet, one of the great things about ‘the city that never sleeps’ is that, well, it never sleeps. People are active from dusk to dawn to dusk. Have food trucks there been able to take advantage of this fact, parking more than just for regular lunch and dinner rushes, and are there any special regulations that deal with late night/early morning/etc times service? 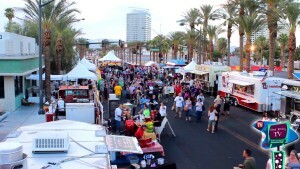 Kelly: Yes and no — LOL – So YES Sin City is 24/7 and this is amazing for food trucks – and it is totally to our advantage if there is a festival or special event happening!!! Others who focus on the businesses off the strip who are open 24 hours (like call centers and office complexes) do find good business for lunch and shift changes. I have not found there to be regulations on this other than we do have to make sure that the Health Department can find us if they want to. Social media is completely helpful with this as most of the inspectors just follow the trucks. From what I understand – if the establishment invites me to be there – I can park there. Q: Do you have any last important bits of information you’d like to share about Vegas for the food truck owner, or any last tips to give? Kelly: YES!!! If you are going to make the investment to be in the Gourmet/Specialty Food Truck business – do it!!! Half-way is not an option!!! I have watched too many new trucks and trailers open with the best of intentions and think they can do the truck part time and work full time. It just doesn’t work out… There is money to be made in this town but you have to be willing to get out there!!! Be realistic with your income expectations in the first 6 months. It is going to be hard! Keep your chin up – keep driving (literally – driving and cooking!) Don’t be afraid to ask for help! 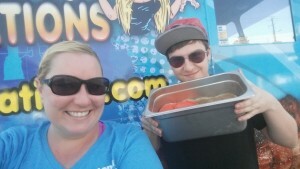 There are a handful of food truck owners who will help you anyway they can!!! 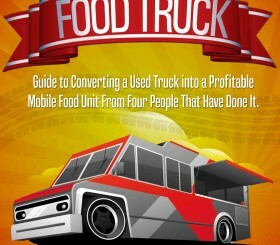 Ready to Take the Next Step and Start Your Food Truck? Learn More. Food Truck Cost Calculator – Find out how much it will cost to get a mobile food unit and equipment. Business Plan – One of the recommended steps before starting a food truck is to get an organized plan together for operating a profitable business. This interview with Anthony Salvagno shows you how to accomplish this. Your First 365 Days on a Food Truck – Download our guide to learn what it’s really like to start a food truck business.